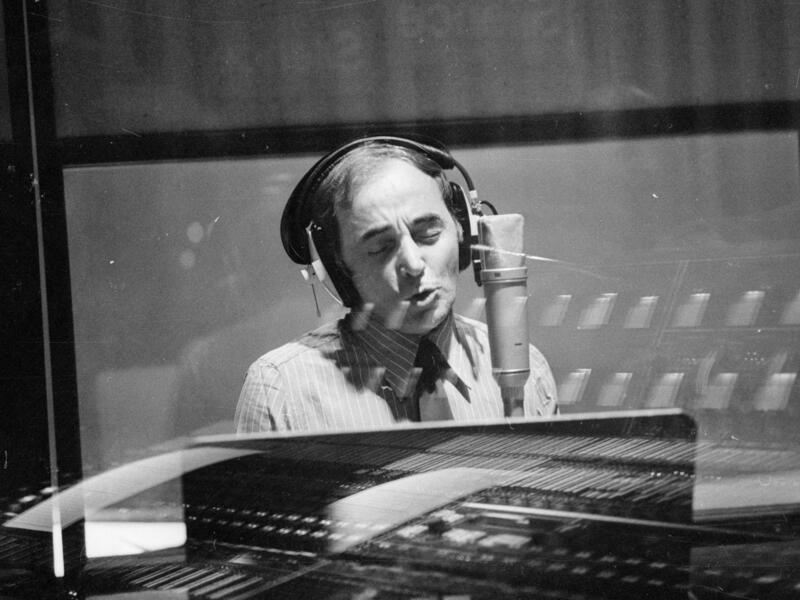 French singer and songwriter Charles Aznavour in the studio in 1974. Charles Aznavour, the singer, songwriter and actor who was a pillar of France's culture for decades, has died at 94. He sold more than 100 million records worldwide and acted in more than 60 films. His death was announced by the French Minister of Culture, Françoise Nyssen, who said: "He sang of love, the passing of time, the joys and disappointments of a life, happy moments, a sweet melancholy. One of the greatest names of French song has left us, an artist known, admired, and loved throughout the world. ... France is losing Aznavour, one of the greatest poets, a true legend who crossed borders and times. The French people are losing Charles, a familiar face who has taken them, for over 70 years, to the land of his great songs." He died at his home in southeastern France; no other details of his death were immediately available. With a voice like caramel, Aznavour poured out tales in songs that helped define the French chanson. Over the course of his career, he wrote around 1400 songs, beginning with works he wrote for his mentor, Edith Piaf. His biggest hit in English was 1974's "She," written as the theme song for a British TV series; Aznavour also recorded the song in French, German, Italian and Spanish. Years later, Elvis Costello recorded a cover of "She" that became an iconic part of the film Notting Hill and sent the song back up the international charts, particularly in the U.K.
Born in Paris on May 22, 1924, Aznavour was the child of an Armenian couple, baritone Misha Aznavourian and actress Knar Baghdassarian, who had fled Armenia during the violence unleashed by Ottoman Turks that resulted in the killing or deportation of some 1.5 million Armenians, in events that fit the modern definition of genocide. Aznavour said in interviews that as thoroughly French as his music became, his culture-straddling heritage was part of his vocal DNA. "It's an Eastern voice," he told the Times. "I have an Eastern voice and a Western way of writing songs." As the son of stage people, Aznavour discovered his love of singing and acting very early, and left formal schooling at age 11 to pursue his dreams. During World War II, he sang in cabarets as his parents worked with the anti-German resistance, reportedly hiding Jewish people and communists in their apartment. Aznavour was discovered by Edith Piaf in 1946, and with his musical partner, pianist Pierre Roche, accompanied her on tour in France and the U.S. It wasn't exactly an official arrangement: As Aznavour told NPR's All Things Considered in 2016, he and Roche arrived with "no visa, no money, no English." He was taken straight to a cell on Ellis Island to be deported. Somehow, he managed to get released, and found himself a room in Times Square, using the same street savvy that got him through the German occupation of Paris during World War II. In 1963, Aznavour returned to New York under decidedly different conditions: he sold out Carnegie Hall. Bob Dylan told Rolling Stone in 1987 that he saw Aznavour in "sixty-something" at Carnegie Hall, and said of the elder singer, "He just blew my brains out." By 1960, Aznavour was the star of François Truffaut's New Wave crime drama Shoot the Piano Player -- a role Truffaut wrote specifically for him. He continued to work as an actor in parallel with his musical career, including in the 1974 film adaptation of the Agatha Christie mystery novel And Then There Were None and in the 1979 film version of Günter Grass' novel The Tin Drum, which won the Oscar for Best Foreign Language Film. In 2002, he starred in director Atom Egoyan's Ararat. His ties to Armenia remained strong throughout his life: In 2009, Armenia made Aznavour its official ambassador to Switzerland. Aznavour was given a star on the Hollywood Walk of Fame in 2017. He also continued touring well past retirement age. "The public has the right to know everything about me," he told All Things Considered in the 2016 interview, remarking on touring into his 90s. "I tell them that I don't hear well, I don't see very well, I can't memorize my songs so I have a prompter, I say my voice is terrible." In fact, he was scheduled to go back out on the road later this month, beginning with a concert in Kiev scheduled for October 20. Aznavour called his audience his "confidantes," and the closeness that name describes was enduring — a true relationship between artist and fans that lasted for many decades. In a tribute posted to Twitter, French president Emmanuel Macron wrote: "Profoundly French, viscerally attached to his Armenian roots, known across the world, Charles Aznavour has accompanied the joys and pains of three generations. His masterpieces, his timbre, his unique radiance will survive him for a long time."